Former heavyweight title challenger Luan Krasniqi (29-2-1, 14 KOs) and Brian Minto (27-1, 16 KOs) will collide for the WBO Intercontinental belt on the big March 17 edition of the "Universum Champions Night" in Stuttgart. It is sure to be a highly charged fight, with Minto having derailed comebacking German icon Axel Schulz last November. The 32 year old Minto of Butler in Pennsylvania, who is known as „The Beast“, is currently ranked at no. 15 in the WBO rankings. Local hero Luan Krasniqi wants to get back into the top positions in the rankings in order to have another shot at one of the Championship belts. "Finally, a fight!," said Krasniqi, who last fought in April 2006. "It was the longest preparation I have ever had. Despite the delay and the injury I was always preparing. I feel fit. I'll give the answer to my fans and above all to Brian Minto on March 17." 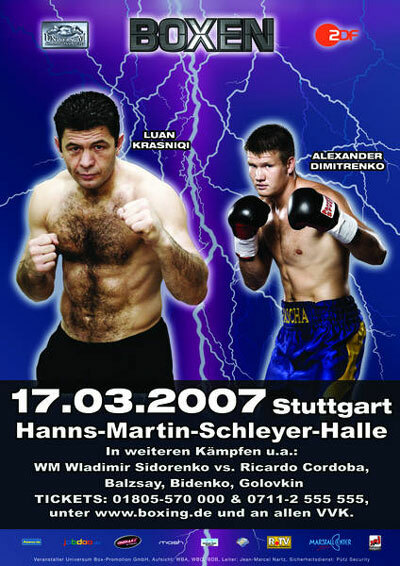 In his last fight in Stuttgart in April 2006, when he defeated the US-American David Bostice, Krasniqi displayed that he never gives up on his dream and still aims to be the next German heavyweight World Champion. He will always be remembered in German boxing history due to his impressive and dramatic performance in the World Championship fight in September 2005, the Birthday of Max Schmeling, when he lost to the American Champ Lamon Brewster. Krasniqi, in the lead on all three scorecards, lost by knockout in the 9th round. Also in action will be unbeaten heavyweight contender Alexander Dimitrenko (24-0, 14 KOs), who will face Danny Batchelder (25-3-1, 12 KOs). WBO-Interconti-Champion Alexander Dimitrenko (24-0-0 (14)) steps into the ring in Stuttgart for the 6th time. The unbeaten 6’7 giant out of the Universum boxing stable wants to continue his way to a World Championship fight, saying: „I don’t care who I will fight, I want to be World Champion. Stuttgart is my second home and it will be a great night. “ A third highlight will be the WBA world bantamweight championship clash between unbeaten champion "mini-powerstation" Wladimir Sidorenko (19-0-1, 6 KOs) and Ricardo Cordoba (29-1-1, 19 KOs). They battled to a draw in their first fight, but Sidorenko has vowed, "I will destroy him." Rounding out the lineup is the return of unbeaten heavyweight prospect Egon Roth (16-0, 12 KOs) who will face Mike Middleton (11-18-1, 5 KOs), Spotlight Boxing heavyweight Taras Bidenko (21-2, 12 KOs) against Fernely Feliz (23-7, 16 KOs) and unbeaten Spotlight super middleweight Karoly Balzsay (15-0, 11 KOs) vs TBA.